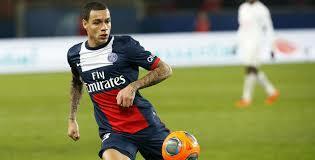 Manchester United have been offered Paris Saint-Germain right back Gregory van der Wiel. The 27-year-old is valued at around £7million and he has one year left on contract. Serie A giants Roma have also expressed an interest in Van der Wiel. A deal is more likely to be done following the news of Dani Alves' incredible u-turn at Barcelona, as the Brazilian committed his future to the club by signing a new two-year deal on Tuesday.